"Cluster analysis is the increasingly important and practical subject of finding groupings in data. The authors set out to write a book for the user who does not necessarily have an extensive background in mathematics. They succeed very well." "Finding Groups in Data [is] a clear, readable, and interesting presentation of a small number of clustering methods. In addition, the book introduced some interesting innovations of applied value to clustering literature." "This is a very good, easy-to-read, and practical book. It has many nice features and is highly recommended for students and practitioners in various fields of study." 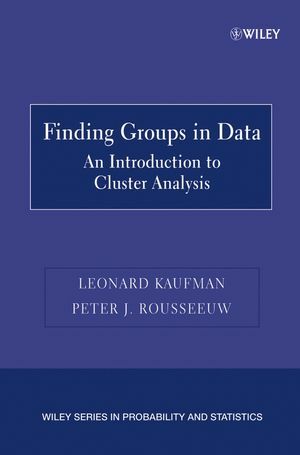 An introduction to the practical application of cluster analysis, this text presents a selection of methods that together can deal with most applications. These methods are chosen for their robustness, consistency, and general applicability. This book discusses various types of data, including interval-scaled and binary variables as well as similarity data, and explains how these can be transformed prior to clustering. LEONARD KAUFMAN, PhD, is affiliated with Vrije University in Brussels, Belgium. PETER J. ROUSSEEUW, PhD, is a Professor in the Department of Mathematics and Computer Science at the University of Antwerp in Belgium. 2. Partitioning Around Medoids (Program PAM). 3. Clustering large Applications (Program CLARA). 5. Agglomerative Nesting (Program AGNES). 6. Divisive Analysis (Program DIANA). 7. Monothetic Analysis (Program MONA). Appendix 1. Implementation and Structure of the Programs. Appendix 2. Running the Programs. Appendix 3. Adapting the Programs to Your Needs. Appendix 4. The Program CLUSPLOT.